Mesoamerica refers to the Americas before the arrival of Europeans. For thousands of years, various tribes and cultures occupied different pieces of land. The most well known were the Incas of Peru, the Mayas of Guatemala, and the Aztecs of Mexico. The Aztecs roamed central Mexico until its Mexica tribe reached today’s Mexico City in 1325. They found an eagle perched on a cactus plant eating a snake, as predicted by their legends, and settled on an island. 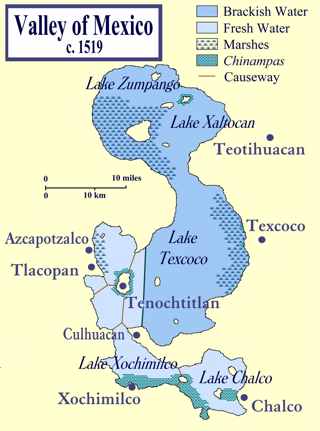 They connected the island city, Tenochtitlan, to the mainland by causeways, and built temples in this capital city. After the Spanish conquistadors subdued the Aztecs in 1519 by allying with rebellious tribes, they drained the lake and built Mexico City as their capital of New Spain. Today, metropolitan Mexico City has a population of 21 million, spread over a very large area. 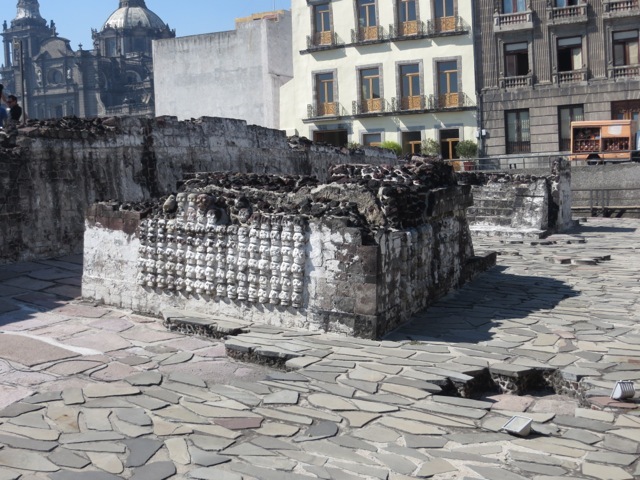 But the historic center of the city lies over the ruins of Aztec temples. 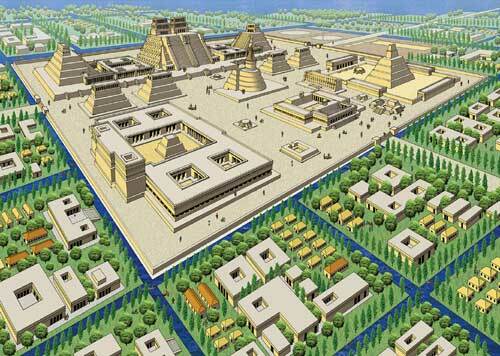 The Aztecs built a religious-political complex in the center of the island. 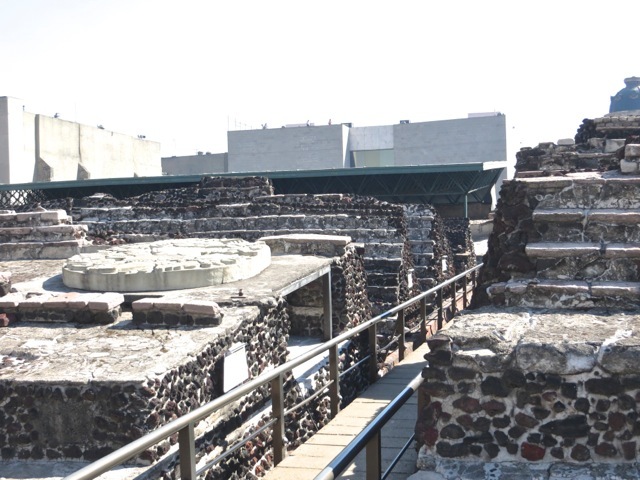 The most prominent structure was the Main Temple, Templo Mayor, where they saw the eagle with the snake. This pyramid was unusual in honoring two gods, one of war and the other of rain and agriculture. 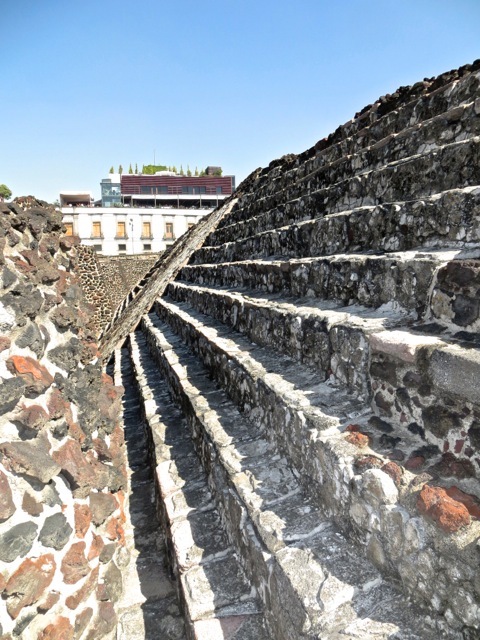 The Spanish demolished Templo Mayor and used the stones to build its cathedrals and houses. 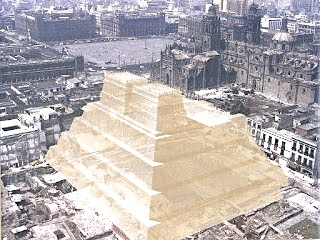 This picture superimposes an image of Templo Mayor on today’s city scape next to the National Palace and the Metropolitan Cathedral. For centuries, the only remainder of this temple was a mound of rubbles called the Island of the Dogs where street dogs sought refuge during floods. 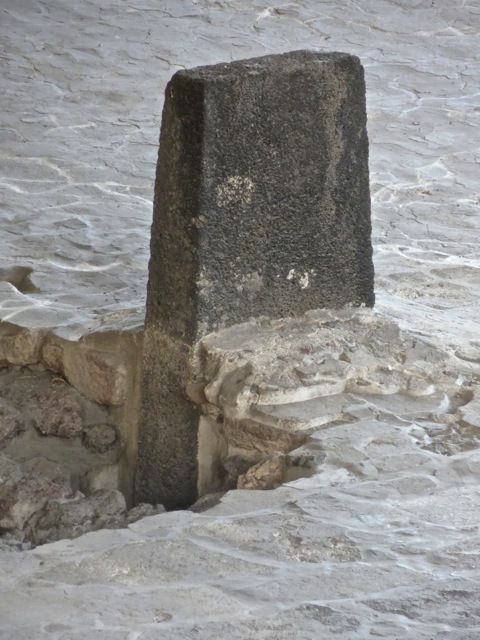 The ruins of the temple was accidentally discovered in 1978 by the electrical utilities. The last Aztec emperor who lost the empire to the Spanish was named Moctezuma. The Mexican archeologist who led the excavation project was named Eduardo Moctezuma. Interesting coincidence. 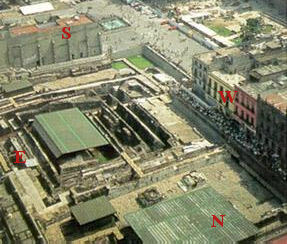 Templo Mayor is built in seven layers like an onion. After the first temple was built in 1325, each subsequent king would add a new layer upon ascending the throne. 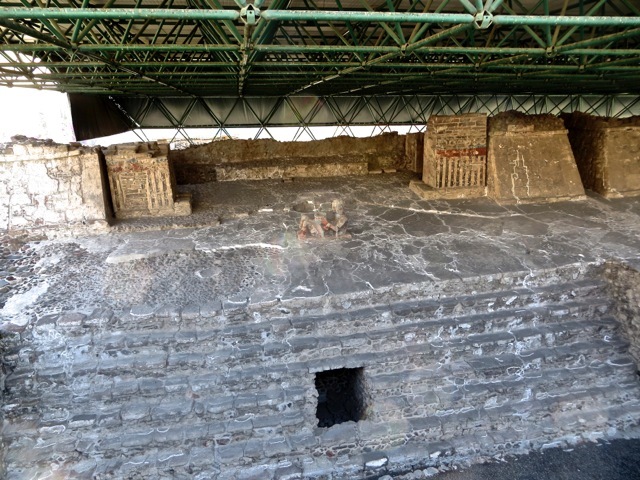 When I visited the temple, I saw the excavated bases of layers of pyramid stairs. Walking from the seventh temple towards the second, I felt like a time traveler going from 1500s to 1300s. The sixth temple was inaugurated in late 1400s during which 1,000 human were sacrificed each day for 20 days. These stairs were drenched in blood. If the Spanish conquest did any good, it was ending this practice of human sacrifice. Like other Mesoamerican peoples, the Aztecs believed the world was created by the gods sacrificing themselves and forming the world with their severed body parts. Human sacrifice and self-mutalation were Aztec rituals of repayment of their debts to the gods. One of the most important duties of their aristocrats was self-mutilation and blood letting. When they were eventually converted to Christianity, the Aztecs related Jesus’ crucification to their former gods’ sacrifices. 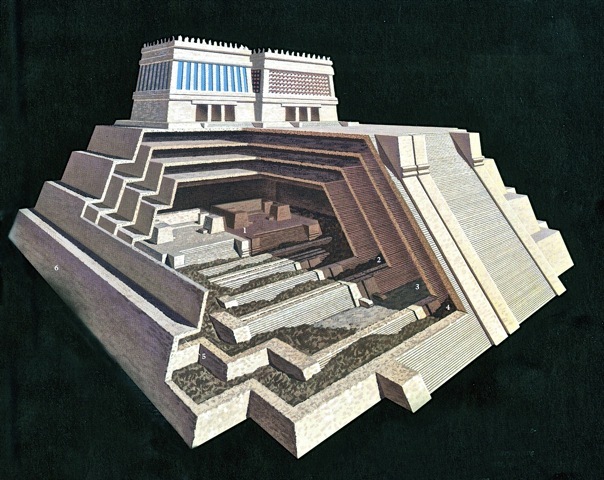 The second temple was not too tall, and the top of its pyramid was not demolished by the Spanish. Two shrines were left intact. This black stone set into the second temple was used to prop up sacrificial victims. 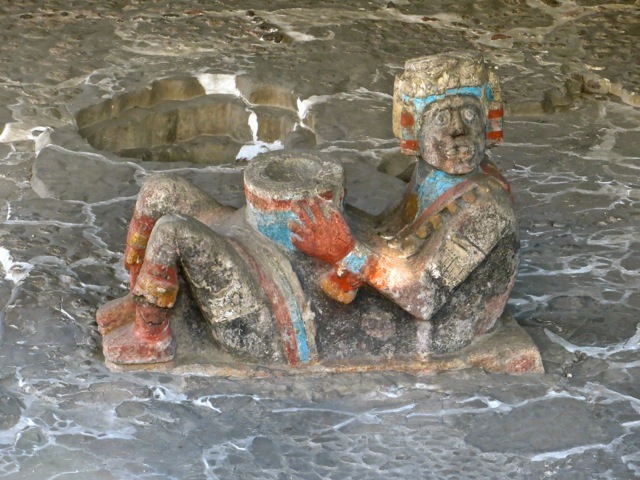 This stone figurine was use to hold offerings of foods. 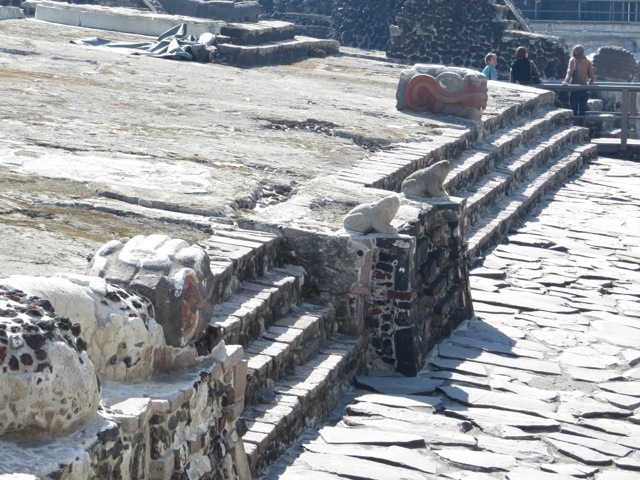 In the forecourt of Templo Mayor rested two frogs as symbols of rain along with serpent heads. 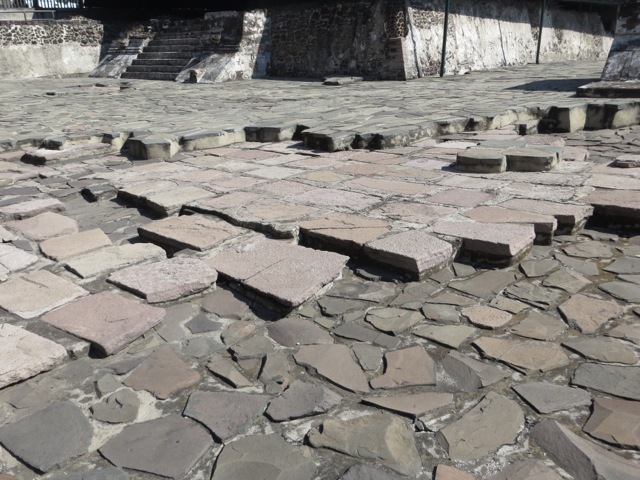 Sequential construction of newer temples are seen in layers of paving stones. In the adjacent House of Eagle Warriors, elite troops meditated and self-sacrificed. Beside the temple, a shrine imitated a skull rack where severed heads were displayed. Its sides were covered with sculpted skulls. 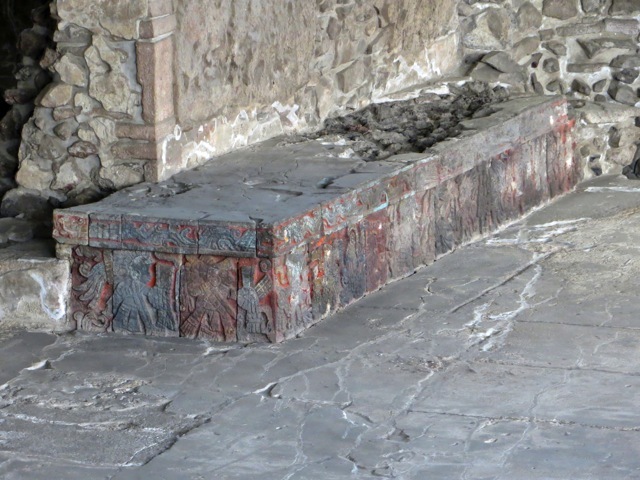 As guardians of their religion, Aztec nobility practiced auto-sacrifice to please the gods. They pierced themselves with sharpened bones, sharp blades, and agave needles; and their blood would be offered to their gods. 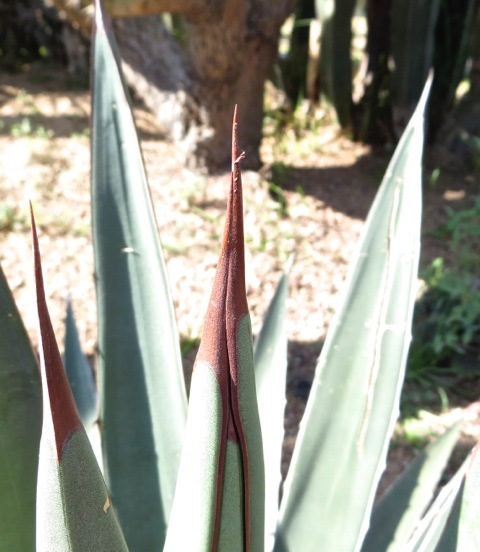 These pointed tips of the agave leaves are extremely hard and sharp. They pierce the skin easily. I pricked my finger accidentally. 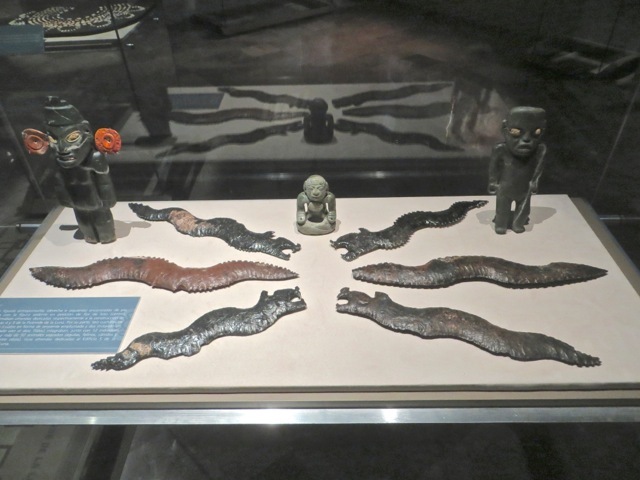 Aztecs made extremely sharp knives by flaking a block of obsidian, a volcanic glass. They developed great skills in flaking off slivers of glass. 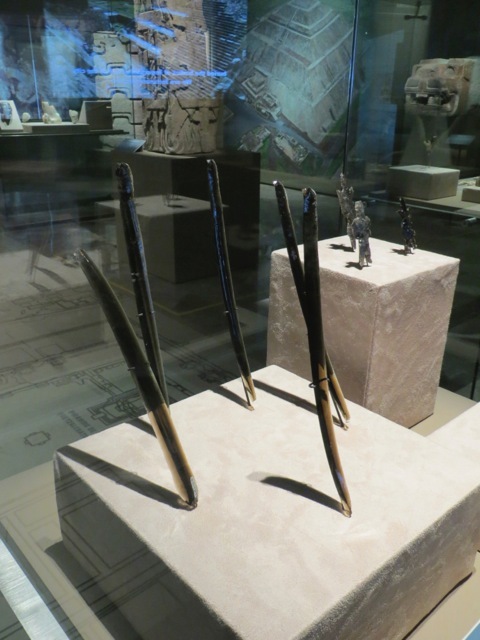 These obsidian blades are many times sharper than the best steel surgical scalpels. Though as hard as hardened steel, obsidian is brittle and cannot withstand impact. 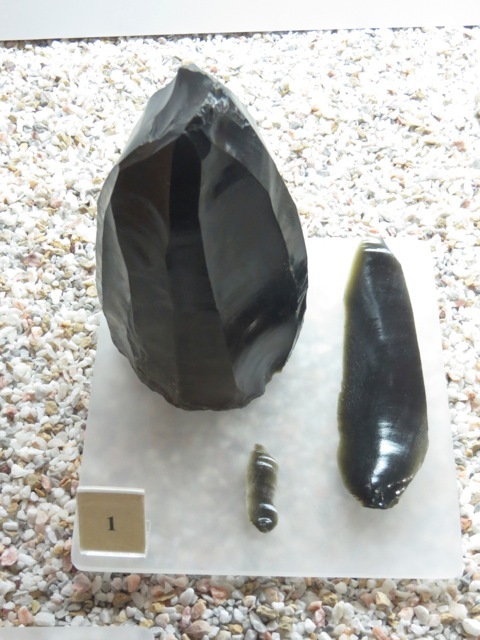 Aztecs made unbelievably slender and sharp obsidian blades. They are so thin they are translucent. One theory why Mesoamericans never developed beyonds the stone age is the abundance of obsidian in their lands. Unlike Eurasia where obsidian is rare, Mesoamericans did not find it necessary to replace their plentiful stone tools with metal ones. Obsidian is extremely hard and very difficult to work on. Aztec artisans developed the technology and the skills to shape intricate and beautiful objects. 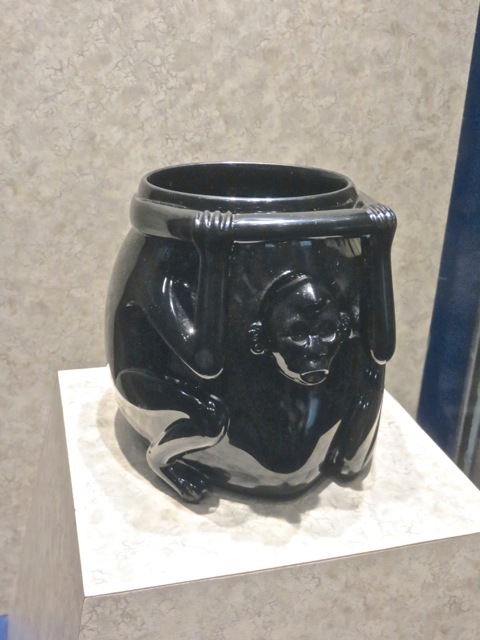 I can’t even imagine the effort spent in creating this urn using ancient tools. 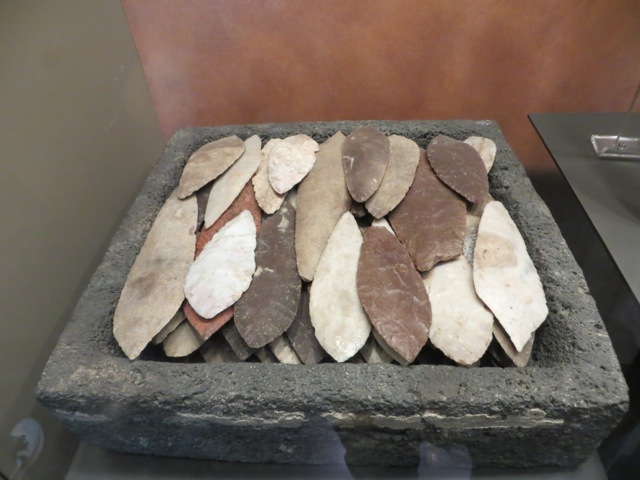 Aztecs used flint, obsidian and other stones to make sharp knives, weapons and tools. 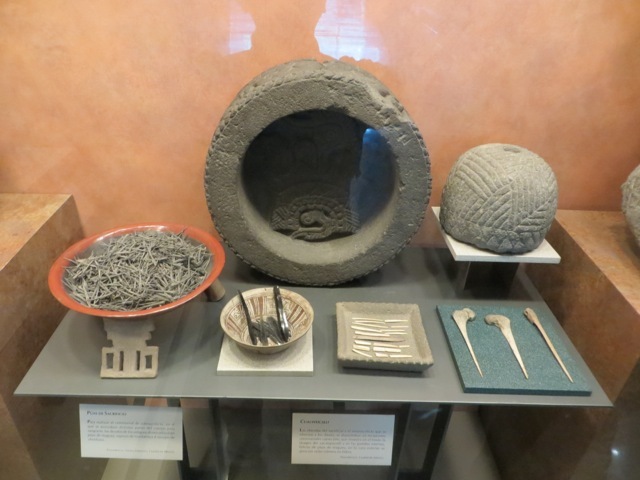 Their skills in making intricate shaped and varied implements changed my impression of stone age cultures from being primitive to highly sophisticated. But the signature Aztec tool is still the sacrificial knife. In my book, the Aztec religion institutionalizing human sacrifice is a bad and degenerate religion. Good riddance. Posted by Robert Wu on Wednesday, April 23, 2014, at 1:58 pm. Filed under Uncategorized. Follow any responses to this post with its comments RSS feed. You can post a comment or trackback from your blog.